Hi Ross! I liked how you wrote each of us a comment. Thank you for sending us the animal cards because we got more wonders. What did the emus evolve from and what is the tallest bird? I wonder how the real name of the emu is pronounced. How can you tell the difference between a male emu and a female emu? If you didn’t send us the cards, I wouldn’t know that emus swim! Which continent is Polynesia on? We are so lucky that we blog with you, Ross! Let's work backwards through your questions. 1. Which continent is Polynesia on? Polynesia isn't a continent. It is a collection of over 1000 islands in the Pacific Ocean. It includes Hawaii in the north, Rapa Nui (Easter Island) in the east, Tonga in the west and New Zealand in the south-west. The traditional people of the islands are known as Polynesian. Having heard the Maoris of New Zealand speaking their language, I have also visited Hawaii. Despite the two sets of islands being so far apart, I was able to recognise words similar to each area. Polynesians share similarities in culture and language. As well as Polynesia, there are two other major Pacific island groups, Micronesia and Melanesia. Melanesia includes New Guinea to the north of Australia. Australia isn't part of these groups as it is both the world's largest island and smallest continent. The many cultures of the traditional people of Australia are very different to Micronesians, Melanesians and Polynesians. 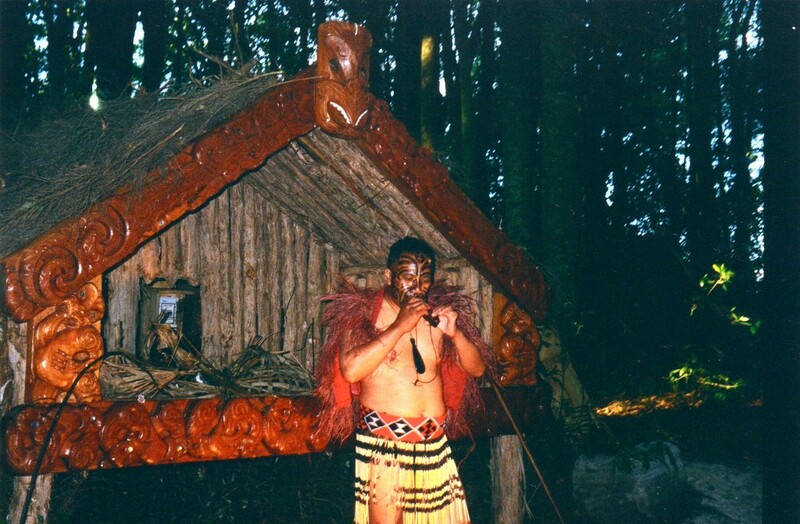 A Maori in traditional clothing. 2. What is the tallest bird? I photographed this moa in New Zealand's Auckland Museum. There were nine species of moas, this being one of the largest two. 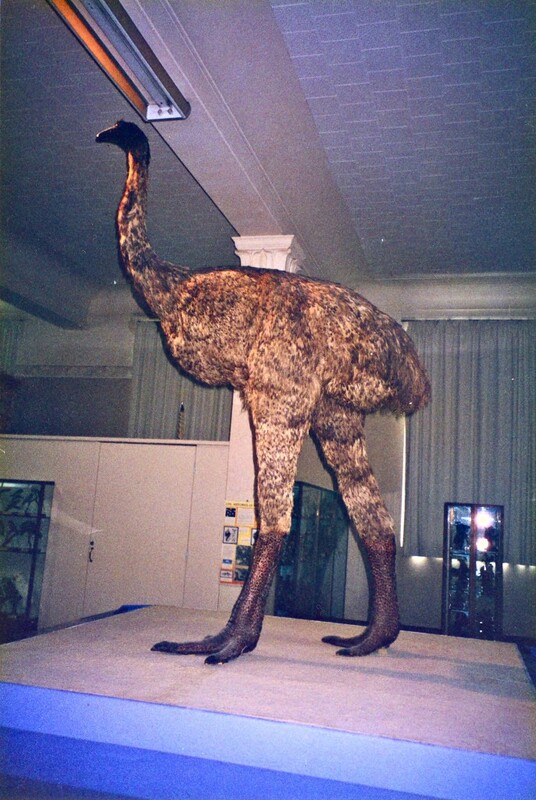 They could reach about 3.6m in height and weigh about 230kg.With the emus reaching up to only about 2m, the largest moas would have towered over them. 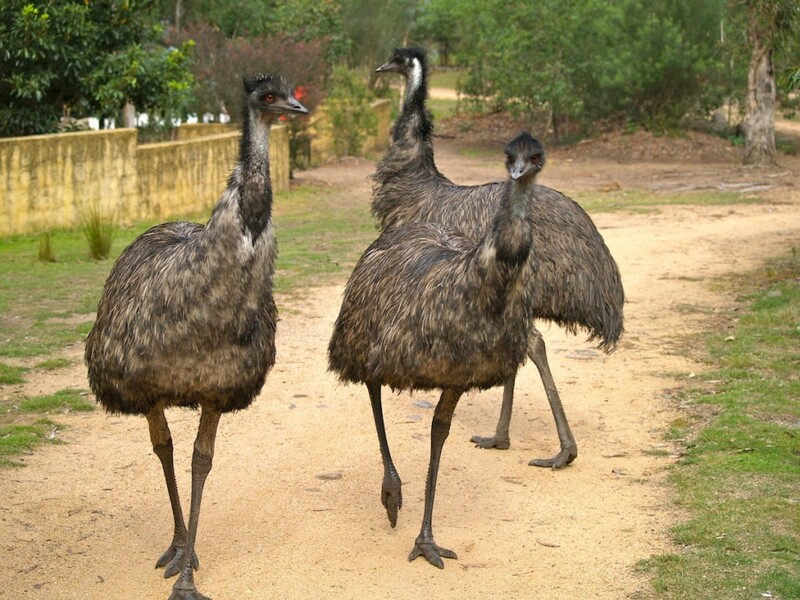 3.How can you tell the difference between male and female emus? The most important answer to this question is the birds can but let's see what I can find to help us. By looking at the photo above, I can't tell the difference between the male and female emus. They look very alike but it seems they can sound different. Males can grunt a little like a pig and, if they're caring for chicks, can whistle to their chicks whereas females make a more booming sound. When I look at emus, I try to imagine them featherless with teeth in their beaks. When I do this, I imagine something like a dinosaur. 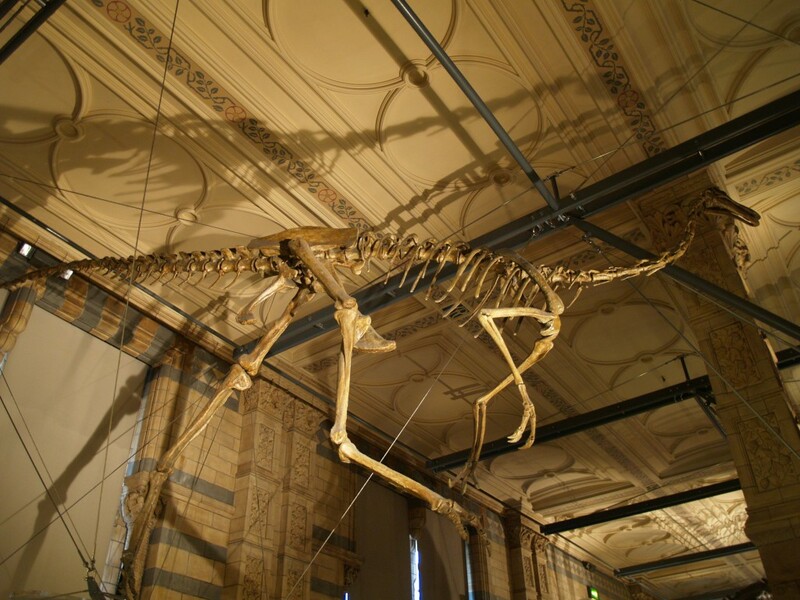 Look at the photo of a dinosaur skeleton I photographed when at a museum in London. 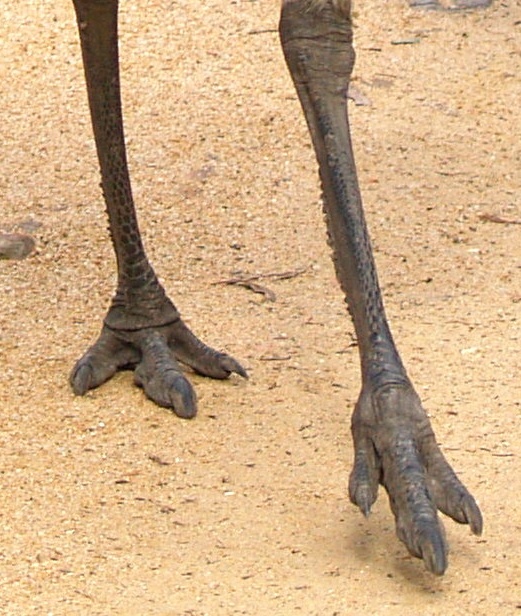 It has a long tail and clawed upper arms whereas emus have a short tail and stumpy wings we don't notice because of their feathers but there are similarities such as in their feet and the way they moved. I suspect the dinosaur was a fast runner and I know emus can run at up to 50 kilometres per hour as I have been driving a car and slowed to see how fast nearby emus were running. Of course, looking something alike doesn't mean they are alike. There can be similarities between very different animals simply because they need to do similar things so let's look at some ideas on the evolution of birds. 4. Where did emus evolve from? For a long time people thought all of the dinosaurs died out with the great extinction caused by a large meteorite hitting Earth but we now believe this wasn’t completely so. We know the large dinosaurs couldn't survive the changes in the Earth but early mammals survived because they were small and fur covered. 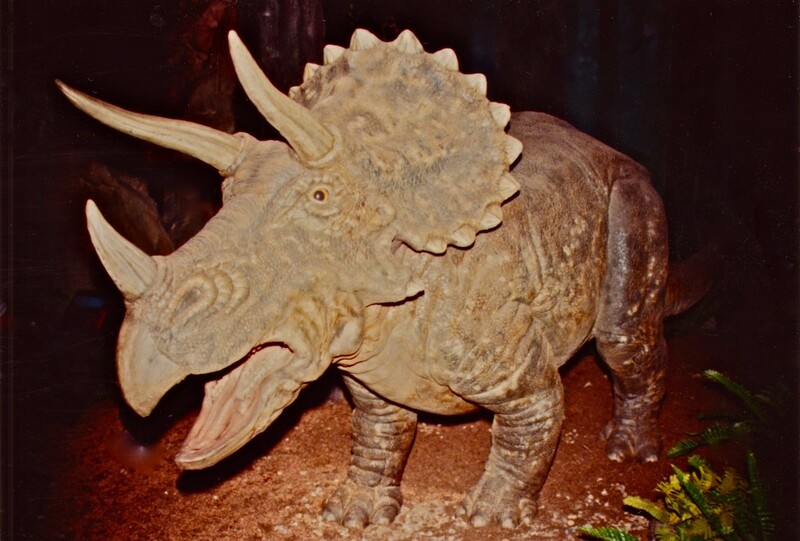 Fossils have shown this but what about the small dinosaurs? By their names, you might think we would be looking at ornithopods but it’s the sauropods I find most interesting, as it seems these dinosaurs include the ancestors of birds. 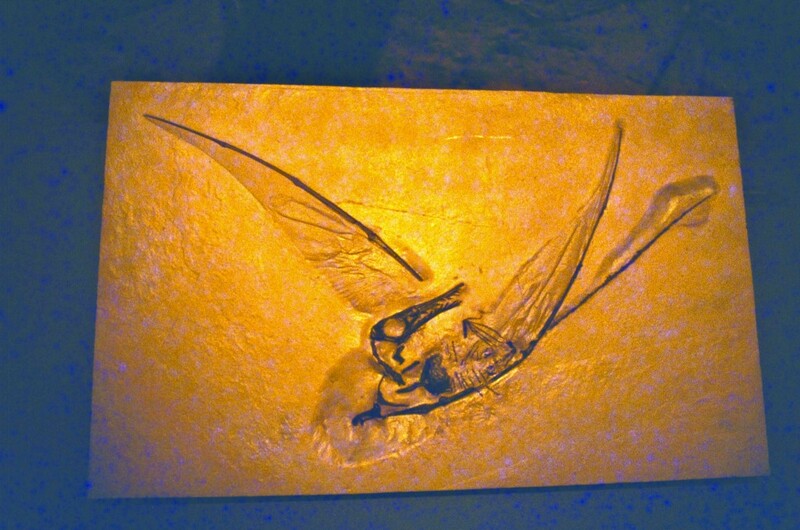 This high quality fossil from China shows a winged reptile and the photo below shows a reconstruction of how they may have looked. These fliers weren't dinosaurs although many think of them as being dinosaurs. They were not the ancestors of birds. 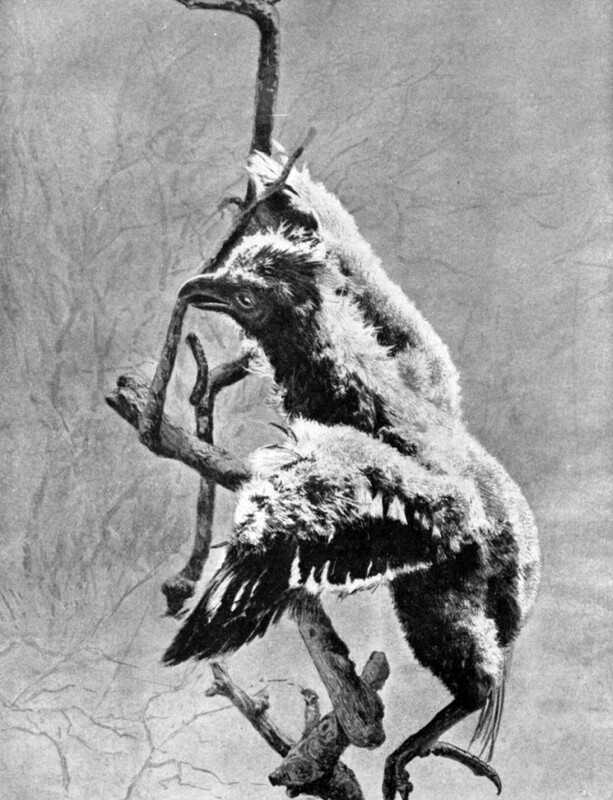 We had no evidence dinosaurs had feathers until a very fine fossil was found in 1861, an archaeopteryx (are-key-op-ter-ix). Look closely at the photo below and you will see the fossil below is so fine you can see feathers yet it appears to have claws on its wings. 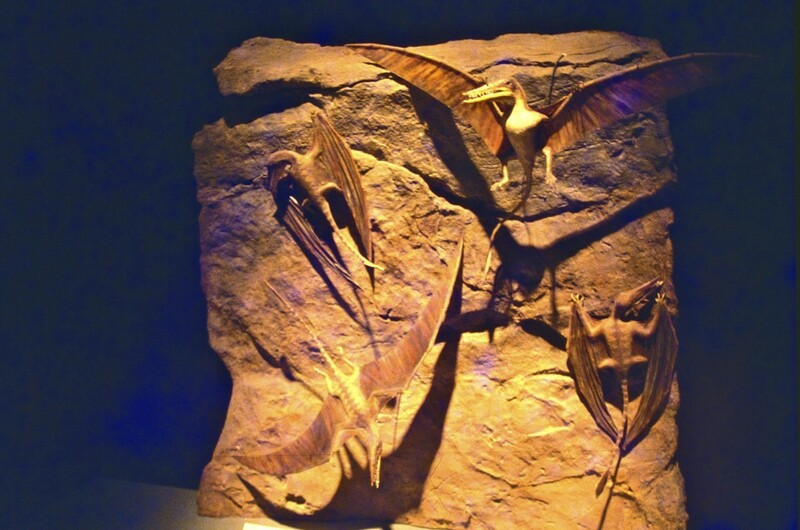 This was not the fossil of a flying reptile. If the feathers hadn't been present, it would most likely to have been thought to be a small sauropod dinosaur. 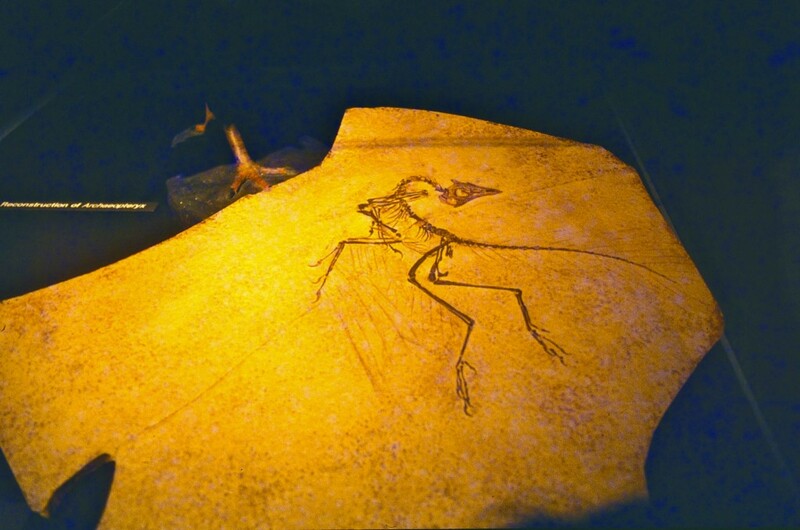 After the fossil was discovered, we could see a link between the dinosaurs and birds. 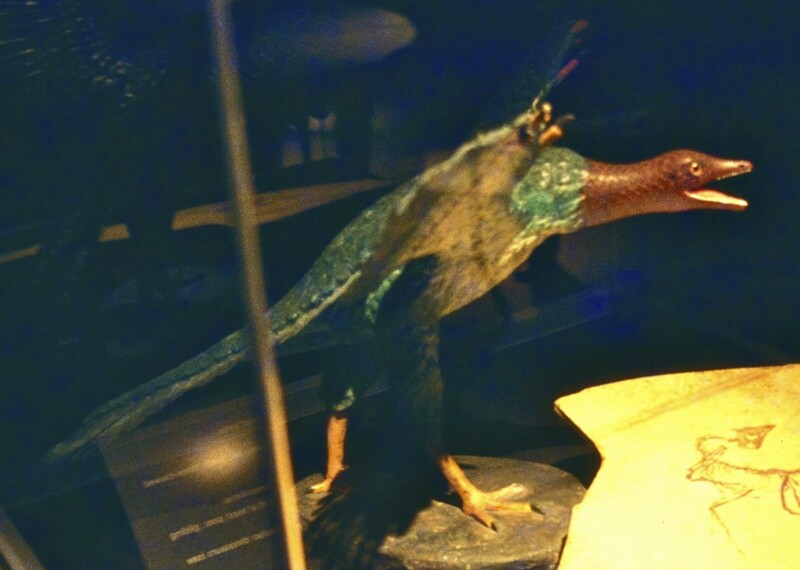 In the photo below, you will see how the archaeopteryx might have looked. Fossils don't preserve colour so the colours are only guesses but sometimes ancient feathers have been discovered in amber and can show colour. Because feathers trapped in amber are rare, scientists can't test them without destroying them to find out more but they have been found to be very old feathers. Scroll down the link and you will see a diagram known as a cladogram. The diagram shows a clade. Clades show an ancestor and all of its descendants sort of like a family tree humans use to show their family. Notice the ancient ancestor starts with therapods and leads to birds? All dinosaurs didn’t become extinct, some evolved into the birds we see today. Do any modern birds have claws? I once wondered if any modern birds had clawed wings and the answer was no until I read about the hoatzin of South America. The hoatzin is also known as the "stinkbird" which gives us the idea it is a little smelly. What interested me was its chicks. The chicks have two claws on each wing to help them climb around the trees where they live but they are true birds and not left over from the dinosaur days. The young lose the claws as they become adults. Below is a photo of a hoatzin chick I found on Wikimedia Commons where it is listed as in the public domain. Science tends to classify birds into orders and into further groups within orders. For the emu, it is grouped with other ratites, or flightless birds including the ostrich, cassowary and New Zealand's moa and kiwi. In the link below, you will see another cladogram, this time of birds. The ratites come off very early on and are separate from all other birds so you could say they are closer to the first birds to have evolved. Emus are modern birds and not dinosaurs but, when I watch them walk, I can imagine them being dinosaurs striding or running across the land perhaps being chased by a carnivorous dinosaur. What do you think? Posted in Animals, Australia, Fossils, Geography, New Zealand and tagged Aotearoa, archaeopteryx, bird evolution, cassowary, dinosaurs, Easter Island, emu, evolution, feathered dinsoaurs, Hawaii, Melanesia, Micronesia, New Zealand, Polynesia, Rapa Nui, Rapanui, Tonga on March 14, 2014 by rossmannell. – the ostrich family contains the biggest flightless birds and emus, cassowaries, maos and elephant birds, (which are extinct). – an ostrich can run 60 kph or more!